Canadian Plasma Resources in Toronto and CanGene Plasma in Winnipeg both promote compensation for plasma donors on their websites, although neither company lists the amount of payment being offered. 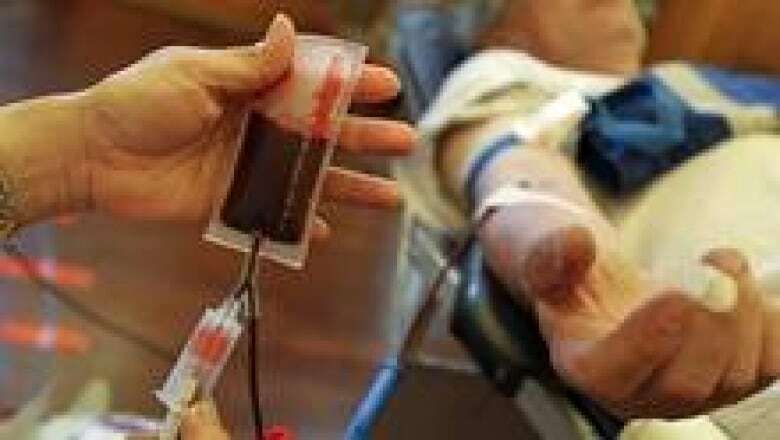 Two Canadian companies are willing to pay blood donors to get their plasma. Canadian Plasma Resources in Toronto and Cangene Plasma in Winnipeg are both promoting compensation for plasma donors on their websites, although neither company lists the amount of payment being offered. Canadian Plasma Resources declined a request from CBC for an interview but allowed its facility to be filmed. Cangene Plasma Resources did not respond to an interview request. While legal, the move to payments is fuelling concerns that compensation could spur people to lie on screening questionnaires, designed to check for risks to the blood supply. "You don't know if people are telling the truth or not, or if they are motivated simply to earn money by donating plasma," said Rick Janson, a spokesperson for the Ontario Public Service Employees Union, which represents employees of Canadian Blood Services, a national, not-for-profit charitable organization that manages the blood supply in all provinces and territories except for Quebec. Plasma is the portion of the blood that transports water and nutrients to all the cells in the body. It is composed of about 90 per cent salt water and 10 per cent protein and electrolytes. Plasma contains many specialized proteins (antibodies) that aid in fighting infections and can be used to make life saving medical products, according to Cangene. Starting in the 1980s, thousands of Canadians became infected with HIV and hepatitis C from tainted blood and plasma imported from the U.S., where donors are paid. In the wake of the scandal and an inquiry, Justice Horace Krever set out conditions for a safer blood supply in 1997. One of the key recommendations from the inquiry was that "significant efforts be made to ensure that blood components and blood products used in Canada are made from the blood and plasma collected from unpaid donors." Krever told CBC News he still stands by that recommendation. Mike McCarthy has hemophilia and contracted hepatitis C from contaminated blood. McCarthy lost two uncles because of bad plasma collected from prisoners in Arkansas. The Toronto man believes there should be a law preventing payment for blood donations. "We are potentially heading down another slippery slope where consumer or commercial aspects take precedence over the safety and well-being of Canadians who depend on a safe blood system," McCarthy told CBC News. Canadian Plasma Resources has a list of potential plasma donors, beds, sterile equipment and staff. It's expecting to open for business in a few months near a university and homeless shelter in Toronto after Health Canada approves the facility to handle blood. Plasma can be processed in the U.S. into immunoglobulin, an expensive intravenous drug used to treat cancer and other diseases. Hematologist Dr. Lois Shepherd, a pathology professor at Queen's University in Kingston, Ont., is dismayed by the move away from the altruistic donation model previously embraced in Canada. She considers the safety concerns surrounding volunteer versus paid donors to be somewhat moot since all blood is thoroughly checked for transmissible diseases. "For me, the bigger concern is that we do rely on volunteer blood donors in Canada, and if we're attracting younger people to be paid donors as plasma donors they are going to be pulled out of a population of people that might potentially be committed red cell whole blood donors." Shepherd noted that Canadian hospitals are top users worldwide of drug products derived from plasma and demand is constantly increasing. She said it's hard to watch the voluntary system be "nibbled away." "This is an incredible change in the way we are delivering health care from the blood system," Janson said. "Nobody even knows this is happening." Health Canada said in an email that its mandate is to regulate the safety and quality of the plasma that is collected for the purposes of transfusion or use in the manufacture of a human drug, which does not extend to corporate or operational decisions such as compensation to donors. Ron Vezina, director of communications for Canadian Blood Services, said his organization has "no plans at this time" to buy plasma from the new Toronto operation.